A common belief is that pain relating to arthritus can be attributed to the weather. Originally featured in Hippocrates book ‘Air, Water, and Places’, dating back to 400 B.C, claims were featured regarding the effects of weather on chronic diseases. Currently, scientists believe barometric pressure could be attritued to the rise in arthritus pain. Those attributing weather to their pain have been known to move to more mild climates or alter the temperatures in their houses accordingly. Dr. John Parenti, director of the Orthopedics Department at the Geisinger Medical Center in Danville, Pa states"Personally, I think it has to do with barometric pressure on the joints," he says. "The nerve endings on the joints have receptors that can sense pressure changes. Heat and cold can affect how people feel, but I think with achy joints, it has more to do with pressure." Despite numerous claims thoughout hundreds of years, proof is hard to come by. 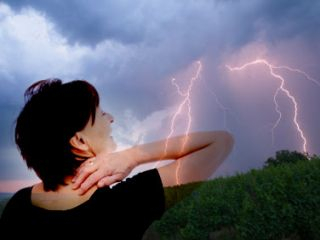 There are many different claims as to how weather affects pain. Some claim the pain is brought on quickly, others say it may take a couple days. Some say barometric pressure increases pain, others say it decreases pain. Due the the lack of evidence regarding this belief many science material simply does not cover it. As for those who relocate in hopes to alleviate their pain, the body will establish a new equillibrium in a new location and will still be affected by weather changes. It amazed me when our textbook put the rest the belief that certain weather conditions can aggravate arthritis. My mom has arthritis and when it rains her pain seems to increase; I wonder if this is a coincidence or there is another reason why she feels worse on certain days.